The short description was already given in the section above, but I'll give you some details before getting into the playability bit. Your mission is to build a car, win some races, progress to get the best car available and win a road race against The King, get his car and his girlfriend. You start by looking at a newspaper from the used cars section, with $750 at hand. You can't get much with it, but you'll be able to get a car and modify it enough to win a few races. Your garage is a wondrous place, the likes of which haven't been seen in too many games since the two Street Rod games. You can change tires, transmission, different parts of the engine, chop the roof, detach bumpers, paint your car and add a sticker to your door. When you're in need of spare parts, or if you're thinking of buying a new car, just take a look in the paper. Now, I know that lots of modern games have all of this stuff featured in some way, but rarely there's such nice animation and that level of participation to working with your cars, as in Street Rod. The sequel made this part even bigger with more parts to handle, but since this is not a twofer, I'll not get any further into that one. Out of your garage, there's only two places to go: Gus's gas station to fill 'er up, and Bob's Drive-In, where you can challenge other drivers for either a drag race or a road race. Both races happen on the same road, only the drag race takes a short straight section of it. You can check your potential opponent's engine, and decide whether he or she could be a good match (or more particularly, the loser) in the next race. If you choose to have a drag race, your choices are to bet $10 or $50, or just race for the heck of it. If you choose to have a road race, you can make a bet for $25, $100 or you can even bet your car in the game - pink slips. If you win a pink slips race, you'll win your opponent's car to yourself. The car parts always wear down, so you will have to buy quite a lot of them. This makes the game quite strategic, so you will always have to think clearly how much you're going to bet in a race, and how are you going to spend your money when you have very little of it. Note that you should always, or at least after every other race, tune your engine to keep your car running as swiftly as it possibly can. Luckily, this doesn't cost anything, but what will annoy the heck out of you at the beginning of the game is how much money you're going to have to spend on tires alone. But hey, racing wears the tires out more than normal driving, so it shouldn't come as a surprise. The only other thing you need to worry about is the cops. When the sirens start the wailing, you know you're facing a lottery ticket in a few seconds, so you'd better keep an eye on your speed-o-meter. I decided not to write a twofer from these two games, because I have never managed to complete the sequel. 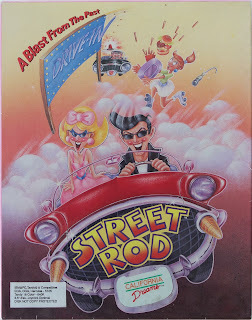 The original Street Rod, though, I have completed on all the platforms it was released on. Which is strange, because I only learned about the Commodore 64 version's existence a few years ago, and tried it for the first time less than a year ago. I can't say I particularly enjoyed the C64 version, having gotten used to the other two, but it says a lot about this game's power to addict, that I still went on to complete it in a few days. Too bad I wasn't doing this blog back then, I could've had good screenshots ready... Anyway, it's not quite as good as a racing game as Test Drive is, but the main focus is really on the garage thing, and that's what makes the racing all the more interesting and will keep you at it, if you're at all into this sort of thing. Whichever of the versions you happen to have, all of them are multiloaders in one way or another. The thing is, it's pretty useless to compare the loading times in this game, because the DOS version will beat the other two in speed due to hard drive capabilities, and the C64 version can't play these sorts of games anywhere near the speed that its big brother does. It's just useless, and this time, I can't be bothered. Sorry. But I'll give you a hint: if you really want to play the C64 version, get yourself an SD2IEC or something like that, so you don't have to change disk sides all the time, and then to speed it up a bit, get a fast load cartridge. Also, the Amiga version supports external disk drives, so buy one, and you'll save some time from switching disks. Anyway, the DOS version wins here, no surprises there. Obviously, it's not the instant gratification type of a game that is so popular nowadays. Every action takes some time to accomplish, but it's the animations and the feeling of actually doing something that makes it an enjoyable experience. But all of that is explained above, in essentials, so the only obvious thing left to explain are the differences between the three versions. 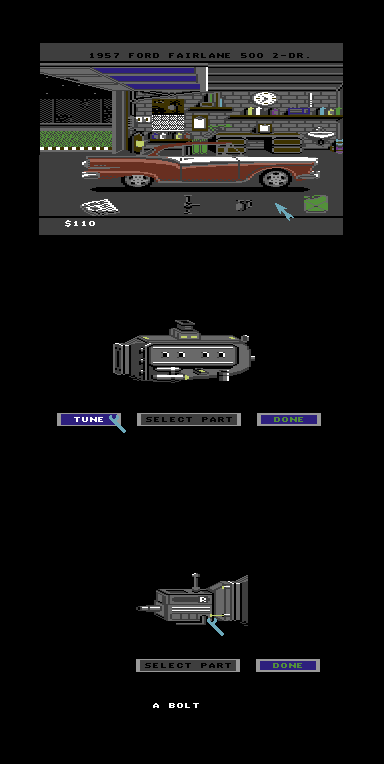 The car modifying and fixing bit is really what makes this game tick, but even that can be pretty damn tedious, if you have a slow joystick controlled C64 version at hand. But it's still much better than not having one at all. I don't own a C64 mouse, but I've read that you can use the 1530 mouse as a joystick substitute. But it's not really too bad, when you compare it to the driving bits, and even they are not completely useless, because they've been eased up enough to make them playable. I'm pretty sure the C64 couldn't have handled the amount of obstacles and stuff that's included in the big machine releases, but I counted something like 14 or 15 curves in the road. Although the driving bits are tediously slow, it's still surprisingly smooth, and doesn't feel too bad overall, when you consider it's still C64. Having played the C64 version for a bit too long for one sitting, I forgot that the other two versions are so much quicker to handle in the racing bits. Most particularly, when you're revving up at the starting line, your cars in the C64 version seem to be just as quick at building up revs as accelerating in any gear. On the other versions, the cars rev up as instantaneously as they really should, I imagine, and it's easier to destroy your engines at the line, if you're not careful. One thing I felt that was a bit more unresponsive on the AMIGA was changing the gears, but I'm not really sure if it was more about the cars I used or the gearboxes, because I played it on WinUAE and a real Amiga to compare the feel, and they both had the same problem. You just really have to be more precise with the gearchanges, but it just isn't responsive enough. The DOS version, on the other hand, plays like a dream, even compared to the Amiga. There's just no delay or problems in responsiveness whatsoever, and the non-existing loading times just help to enhance the playing experience. There are more obstacles on the road, but since it's easier to play anyway, it doesn't really matter. The road race on the Amiga version seems to be the longest one, but has one less roadworks bit and more curves. In the DOS version, the driving feels more like you're in charge of the car instead of the car being in charge of you. 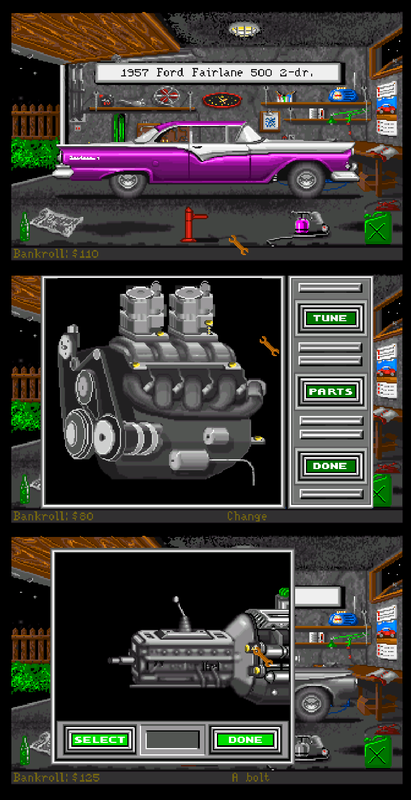 When it comes to modifying and fixing your cars, the Amiga version looks better, but since it plays slower due to constant disk accessing, it just isn't as pleasurable to play. 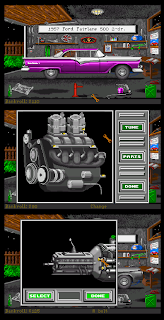 So, all in all, the DOS version seems to be more about the pleasure of driving and tweaking, and the Amiga version seems to be more about the tunes and graphics. The C64 version seems to exist simply because it can, although it hasn't been said anywhere, which version came out first. The Amiga was the last one to have one, so it's not exactly a wonder that it felt the most developed of the three. This is why it took me such a long time writing this entry. The time it takes to play this game through on every machine it was released on (emulated, of course) is just horrendous because of the loading times, and I didn't even go so far as to compare EVERY opponent and EVERY car in EVERY colour. This is just the obvious bits, which I think will - or should - suffice. So, let's start with the 8-bit one. The 8-bit loading sequence is a bare bones kind of a thing. You get the publisher logo, the game title screen sort of trying to mimic what's on the cover in a fridge-magnet kind of way, and the credit screen shows a version of the license plate with 7 names in the development group. Not too bad, but I've seen a lot better graphics on the C64. at least in some way. And then the AMIGA version comes to show off with some sparkling animations and generally much prettier graphics. The only thing that I could say was a bit off are the faces on the two young people, because here they look... well, better I guess, less caricature-like, really. The credits show that less people had worked on the Amiga version than on the PC, although I can't say if that's a good or bad thing. Copy protection screens, left to right: C64, DOS, Amiga. If you're a detail enthusiast, this might be quite interesting for you. See, not only is the C64 jukebox completely different-looking to the other two, it's actually more like a real jukebox by the look of what's inside the thing, and how it's decorated. The only other thing worth noting could be that colour #1 is written as "gray", and in the other two versions, it's "grey". Does it make any difference to the game? No. Does it have a deeper meaning to the development process and release order? Could be. Do we care? Sort of. Does this information lead us anywhere? No. Newspapers, left to right: C64, DOS, Amiga. shading, and of course, the car adverts got some more colour. Somehow, the overall look of the C64 version looks a bit flattened, like something between VIC-20 and NES, but the colour scheme is definitely more Commodore than Nintendo. You could sort of see it already in the loading pictures, but when you get to the garage, it really starts to show. You can see how difficult it was at that time to process that amount of graphics, car build variables and the little of what's fitted in of the music that might have been intended. Even the engine and transmission modification screens needed to be loaded seperately into their own screens so the main garage bit wouldn't slow things down. In the DOS version, everything starts to look closer to what Magic Partners were probably thinking of, but the colour palette and the VGA monitors' rough way to handle pixels don't make it all that inviting. At least the game plays with no loading times, so you can't complain. The only thing that looks like it was very little changed from the C64 version is the engine, which looks strangely flat and lifeless. But still, the engine and transmission modding screens are now small windows on top of the garage screen. Two new things have been added in the garage for the DOS version: a bottle, which you can take a drink from - although you shouldn't, and the sticker box to spend some more money on uselessly to make your car look more teenage than is necessary. Nice, but useless. Again, the AMIGA has the advantage of being the last to be released, thus having more development time. The graphics are just stellar. Everything looks more colourful and detailed, easier to notice and get disappointed that you can't actually use every item in the garage, because it looks so cool. The engine, in particular, looks more like an engine, and acts like one as well. Everything looks so nice, that you can almost forgive the loading times after EVERY little thing you do. Almost. Sometimes, you need to get some gas, so you click on the jerry can in your garage, and you'll automatically drive to Gus' Gas. Every version of the gas station looks radically different, but there's some similarities as well. Gus' Gas is built alongside some regular looking brick house, with a chimney, an iron fence and some trees around the house. Gus is always seen sleeping on his chair in a backwards leaning fashion. There's always two tanks for pumping gas, of which only one is available to your using. And finally, there's always a Coca-Cola vending machine somewhere in the picture, although on the C64, it looks more like a telephone box. Somehow, it seems that there's either a Gus' Gas station chain in 1963's Los Angeles, or it's always situated in a different part of town in each game. In the C64, you can't really make out where it is, but the PC version has it somewhere in the outskirts of the town, near some mountains, and the Amiga version has it in the town center. Also, the C64 version doesn't have a washrag, the PC version has but you can't use, the Amiga version has one and you can use it, but it doesn't have any effect. Somehow, I like the PC version's looks the best in this one bit, although the Amiga is clearly the prettiest. Gus' Gas, left to right: C64, DOS, Amiga. Bob's Drive In is the place to go to, when you're looking for some racing action. Again, every version looks different, but this time it's only a matter of details between the DOS and Amiga versions. The C64 version, however, has it a bit more radically different: the two cars in the background are in different places; there's no cook hanging at the middle window; there's very little people around anyway - the only ones you see are the two people in the rightmost window and that butch guy leaning against a pole. The sign is also very different from the two other versions, and from the two other little details left, it isn't the front door that's missing from the other versions that hits your eye the first - no, it's the huge Marlboro sign at the left end of the middle window, where the cook should be. At least you won't have to wait for the rollergirl to bring food to virtually non-existing people, there's enough time going to waste waiting for the opponents to pass by. Other than being practically the same screen in both DOS and Amiga versions, it's really a matter of details, which we have already established enough that the Amiga wins this bit easily. It's just more comfortable and visually better at representing the style of the time. Bob's Drive-In, left to right: C64, DOS, Amiga. Finally, we get to the racing bit. Unsurprisingly, the C64 looks ugly, but at least it scrolls forwards at an acceptable speed. There's some stuff at the sides of the road that you can crash into, and everything else looks just recognizable enough to be acceptable in the background. You'll be concentrating on the road much more than on the details anyway, so it doesn't matter all that much. I think this occasion is an appropriate one to lay this quote: "That'll do, pig." The same thing could also be said of the DOS version, but it's just so much clearer than on the C64, that it serves the purpose of the racing section just as well as the Amiga version, although the latter looks a lot better inside the car. It's just that the road scrolls more fluently on the PC, and because the PC version handles better as well, I'm inclined to think the other graphical qualities on the Amiga made the gameplay a bit worse. Racing, left to right: C64, DOS, Amiga. I would make a comparison of the stuff regarding your worst opponent, The King, but I have to admit, the C64 version plays so slowly and it's such a huge job to complete it, that I simply couldn't bother to go that far this time. The PC and Amiga version I could somehow work with, but the control problems in my playthrough of the Amiga version became too much of a bother while racing The King, that I got frustrated and took the screenshots from YouTube. Doesn't look as clear, but whatever. 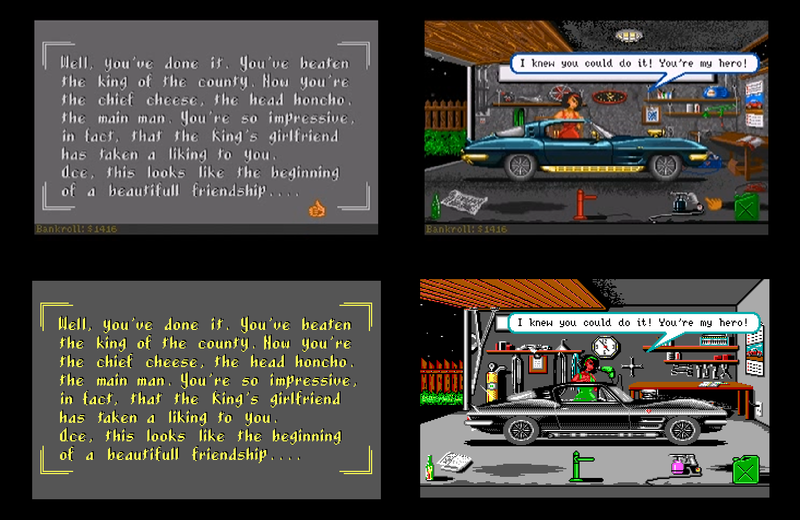 Challenging The King, screens from Amiga (left) and DOS (right). Speeding tickets from C64 (left) and DOS (right). As mentioned at the beginning, rock 'n' roll is the theme here, and that goes for the soundtrack as well. The radio at your garage will play some of your favourite 50's (yes, it really is more 1950's than 1960's) style rock 'n' roll songs when you're fixing your ride. If you click on the radio to "squelch it", you'll hear that rock 'n' roll no more. The decision you make about having the music in the garage will affect the rest of the game, so if you turn the garage radio off, there will be no music elsewhere either. But, I suppose it'll be easier on most of your nerves to turn the radio off after you're done with fixing your car. There's at least three songs in the AMIGA version that I could recognize as something very much like some real old rock 'n' roll tunes, namely "See You Later Alligator", "Shake, Rattle and Roll" and something closely resembling "In The Mood", which is actually a jazz standard. Naturally, due to the lack of memory in use, the C64 version only has one tune on a constant loop. It's based on Fats Domino's "Boogie Woogie Baby", and takes 32 seconds to loop. It can become bothersome more quickly than the Amiga soundtrack, but it's still a nicely fitting tune. The DOS version only has the beeper to use, so it's monotonal. Still, the tunes are recognizable as something like old times rock 'n' roll, but the way the instruments get on each other make the song recognition nearly impossible. At least there's at least 3 songs that repeat back-to-back, so it's not too bad. And you can always turn the music off. Other sounds include using tools in the garage, gas pump at the gas station and car motor sounds, which vary from motor to motor. Also, when you crash, you'll hear a crash, and when the cops are after you, you'll hear a siren wailing. And that's pretty much everything you'll hear in this game, but it's quite enough, considering the genre. I'd say, if it wasn't for the beeper music and the fact that you couldn't really adjust the PC speaker's volume unless you're playing on DOSbox, the DOS version would sound relatively good. But because we have to take such things into consideration, I have to say the C64 version wins the PC in this occasion. The Amiga version clearly wins, because it has everything in abundance, and in an ear-pleasing format. 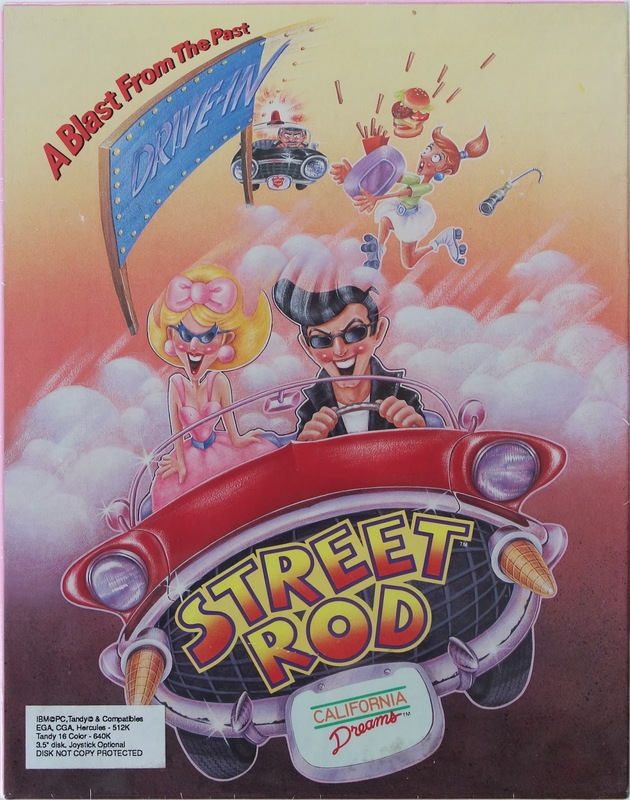 Street Rod was one of the earlier examples of games having bigger development teams due to the amount of work they would require. Whoever the Magic Partners were, they certainly created work. For a game brought to life by a team of 19 people, from what I counted off the license plates, almost everyone working on a different version, it's pretty remarkable that all three versions came as close to each other in playability and overall feel as they did. I've got a feeling that the C64 and DOS versions were developed and released simultaneously, considering the people involved in both cases, but it could be that the C64 version was the first one as well. Some people from both versions went on to work on the Amiga version to be released the year after. By no means are any of them equal to each other, but considering the machines, they were all quite remarkable achievements, and I might say, brilliant games in their own rights very much worth owning if you possibly could. Nowadays, they are entirely too rare for my pocket, and I can't say that they were all that common back when it was a new game, either. It's one of those games that got popular through piracy, I'd say. Ending sequence: Amiga (above) and DOS (below). Great side-by-side comparison of Street Rod on different platforms. Loved this game on the Amiga.. it's really a shame the driving part was below average.